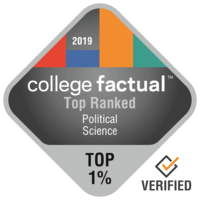 2019 Best Political Science & Government Colleges in the U.S. There are around 38,804 students graduating with a degree in Political Science & Government every year. This helps make it 14th most popular out of the 384 total college majors analyzed. This major is ranked 54 out of 121 majors when it comes to earnings potential. Some colleges offer greater outcomes than others. Below you'll see a list of the best colleges and universities to study Political Science & Government. Our ranking methodology takes into account education quality, average earnings of graduates, accreditation, and several other relevant factors. If you want the very best training available in Political Science & Government you simply can't do better than Georgetown University. A preferred major for undergraduates, there are about 277 learners enrolled in this program at Georgetown. The surrounding area of a large city is wonderful for young people trying to find adequate choices for social networking, excitement, and discovery. There is an advanced degree program obtainable for students who are intrigued. Around 47.0% of applicants submit ACT scores, with the typical score being in the 32 range. Look at a few school videos for more information on what is happening on campus. Any student pursuing a degree in Political Science & Government needs to check out Columbia University in the City of New York. Soon after graduating, political science students typically make around $51,076 at the beginning of their careers. With over 20,000 students, this school is among the largest schools in the country. It's hard to find a better school than Princeton University if you wish to study Political Science & Government. After graduation, political science students typically make around $54,580 in the first five years of their career. Located in Princeton, New Jersey, Princeton supplies a safe and sound, suburban atmosphere for learners. It's hard to find a better school than Washington University in St Louis if you wish to study Political Science & Government. After graduation, political science students typically earn about $63,829 in the first five years of their career. Washington University in St Louis is located in the suburban region of Saint Louis, Missouri, near to shops and other entertainment. It's difficult to beat George Washington University if you want to study Political Science & Government. Students who graduate from this program report average early career income of $42,643 and mid-career income of $89,857. Washington, District of Columbia is an excellent setting for college students who get pleasure from the active city life. It's hard to beat Harvard University if you want to pursue Political Science & Government as a major. Harvard University political science & government majors make 37.2% more than the standard political science grad. This school is one of the largest schools in Massachusetts. Every student who is interested in Political Science & Government needs to check out University of Pennsylvania. University of Pennsylvania offers graduate degrees in political science for those interested in an advanced degree. University of Pennsylvania is among the largest schools in Pennsylvania. Any student pursuing a degree in Political Science & Government has to take a look at Yale University. Political science graduates from Yale University get a earnings boost of approximately 36.4% above the typical income of political science & government graduates. The setting in a large urban center is great for students seeking out considerable options for social networking, excitement, and exploration. Any student pursuing a degree in Political Science & Government needs to take a look at Dartmouth College. At Dartmouth College, 12.7% of undergraduates major in political science. Students who like a more relaxed life will appreciate the school's position in the smallish town of Hanover, New Hampshire. Dartmouth features a high performing men's football team. This school requires first-year students to live on-campus. Take a look at every one of Dartmouth College's rankings to know more about the college. Duke University is a great option for students pursuing a Political Science & Government degree. In addition to its bachelor's programs, Duke University offers graduate degrees in Political Science. The setting in a big urban center is wonderful for students seeking ample chances for networking, experience, and discovery.